Definitely recommend Entertainment Solutions! They are what made my day a success…from ceremony music to the lights and music at the reception…plus Chris was my MC! Couldn’t be more pleased with the service I received… Chris was very helpful in the planning stages and met with me several times to discuss any questions I had. He was very flexible and knowledgeable. I would absolutely book them again if I needed. My guests also commented on how good he was! Chris is amazing! The dance floor was full all night and he made a fantastic MC! Thank you Chris for your professional services of not only being a DJ, but an MC as well! The dancing on a cloud effect was amazing! We truly appreciate your input on the night’s activities and in which order to have them. The lighting around the room was beautiful and the music was fantastic, as you had everyone on the dance floor all evening! We truly appreciate your wealth of knowledge and services. 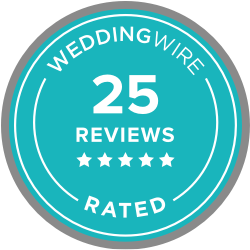 We could not have asked for a better company “Entertainment Solutions” to provide us with exactly what we needed for our wedding reception celebration. Thank You Chris for making our reception a happy memorable night! You’re the best! Chris, of Entertainment Solutions, was everything that we were hoping to find in a DJ. He was incredibly kind, very flexible, and more than responsive whenever we got in touch with him. Chris was the music coordinator at our ceremony, and was also the DJ at our reception. Chris worked with us to ensure that he brought the vision that we had of our wedding reception to life. He also worked closely with our hall decorator to ensure that his up lighting reflected and coordinated with our decor, and the end result was stunning. Always willing to go above and beyond for his customers, Chris even attended our wedding rehearsal to ensure that our wedding day ran as smoothly as we envisioned it. As for our reception, it was exactly as we expected, and even more! My guests raved about the quality of his music, the choices that he played, and, as my family members have said, that he “kept the party going all night!”. We’re so happy that we went with Chris – he truly is the best in town. Chris was awesome and had the dance floor full the entire time. The fog machine was a big hit. I also enjoyed the garter gun. What a cool idea. People keep telling us that our wedding was the best they’ve been to and we can thank Chris for that. Entertainment Solutions did an amazing job at our wedding. Chris had a variety of techniques and games to get all the guests up on the dance floor! He did an amazing job at reading the crowd, not once was the dance floor empty! I had so many compliments on the entertainment, but I can’t take any of the credit! They went above and beyond any of my expectations! We were able to relax and truly enjoy our day! What a difference it makes when the music and the entertainment is great! They were with us throughout the entire day for the ceremony, cocktail hour and reception!! What a fabulous job!! We had Entertainment Solution at our wedding June 9th 2012. Chris Gray are DJ did and amazing job he transformed the Garson Arena into my vision….Are guest where all pleased with his song selections and the way that he interacted them was amazing…We would highly recommended Entertainment Solution to are friends and family. I was very pleased with Entertainment Solutions DJ. I would definitely recommend them to a friend/other brides. Chris and his assistant were very professional and presentable. He played a good selection of music and was very quick with requests, etc. He was very good with the microphone and spoke in a very clear, professional matter. They were very helpful in recommendations for music and helping me in making our day perfect. I was very impressed with our overall experience. Thanks again! Chris was flexible and able to meet with us, he also answered our questions efficiently. He had great ideas and listened to ours. The big day he was very professional with us and the guest. It was a very good environment. I strongly believe that the night is a big success if you have a good DJ. The night was a great success! The guest we’re very pleased with him and the music. (a very good variety and balance.) I don’t think the dance floor was ever empty. We would highly recommend him for any wedding or event. Thanks again! We were thoroughly impressed with Chris, and that’s saying something since after meeting with him we set the bar very high. Beyond the great selection of music and excellent sound package he also delivered outstanding lighting which set our venue over the top. We’d recommend him to anyone. I usually don’t give a 5/5 rating but the attention to detail was outstanding. Chris and Keiran listened to everything we had suggested, while maintaining a fantastic variety of both music and lights. We had a rock and roll themed wedding and they really stepped it up to the highest caliber possible. They put up with our indecisiveness professionally, and enthusiastically made every vision for our wedding a reality. A gigantic thank-you for a rocking good time. Great Service!!!!! Recommend for future please no not play last song for bride and groom in the middle of the night, other than that perfect!!!! You guys were the best, I look forwars to telling other couples about your performance. Chris was very helpful and really went out of his way to make sure the music was great. My husband and I were a bit picky on how we wanted certain songs played and timing and Chris met all those needs. Would defiantly recommend him! Our DJ (Chris) provided both excellent and professional service. Chris was terrific to deal with during the contract signing period and the weeks leading up to the wedding. His performance during our Wedding day was absolutely amazing and over-the-top! Both during and after our Wedding, a number of guests remarked how wonderful Chris was and more specifically, how he played such great music that got everyone on the floor. Thank you Chris for your wonderful service!